While Star Wars: Rebels centers around a spaceship crew doing their best to stick it to the Galactic Empire, it will be a while before we see a full Rebel Alliance form. That's because, as the show's producers explained at yesterday's Comic-Con panel, a lot of people feel that the Empire has brought stability to the galaxy. PLUS NEW CLIPS! 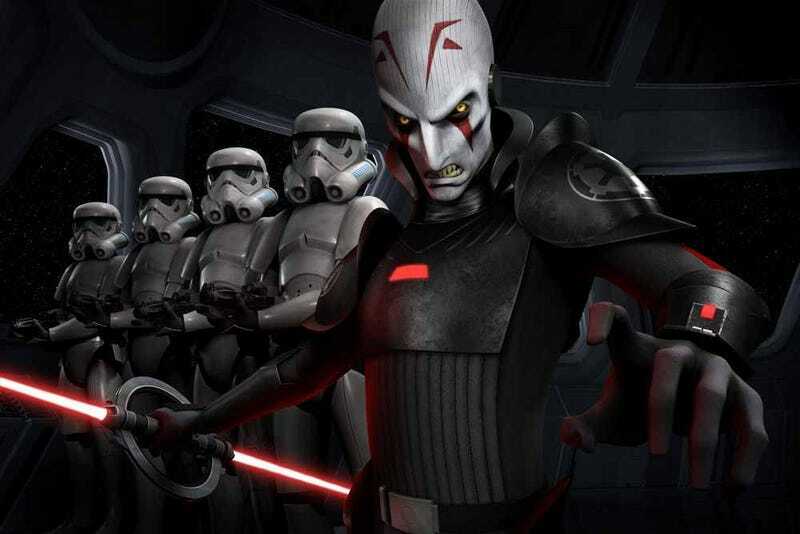 Star Wars Rebels producers Simon Kinberg and Dave Filoni came to San Diego Comic-Con with the show's main voice cast to tell us what we can expect from the new animated series. While bridging the gap between Episodes III and IV allows them to bring the tone of the show closer to that of the original trilogy, they said that it also gives them more freedom in terms of what they can do with the Sith and Jedi. But it's that direction toward the original trilogy that particularly excites Filoni. As much as he loved developing the Clone Troopers in Clone Wars, "There's something about what you grew up with. It's exciting to see the Stormtroopers come to life." While the series is leaning more toward the designs from Ralph McQuarrie's original concept art, Filoni finds the familiar thrilling, especially when he got to see a brand-new shot featuring a Star Destroyer. But just as we got to see new aspects of the Empire throughout the original trilogy (such as the Snowtroopers on Hoth), we'll see new Stormtrooper types in Rebels. At the same time, they'll be filling in the details about the rise of the Empire and the emergence of the Rebel Alliance. It is not, the producers explained, that the Rebellion formed as an immediate response to the Empire. The people of the galaxy are tired of war, and many see the Empire as a new form of order replacing the former chaos of the Clone Wars; that's how they've achieved an unquestioned control of the galaxy. The Jedi, on the other hand, are viewed as failures and traitors to the Empire, something that is bound to be a problem for our renegade Jedi Kanan and his apprentice Ezra. And even though the crew of the Ghost is fighting their own battle against the Empire, at the end of the day, they need to find food and gas, the basics. One way in which Rebels will differ from Clone Wars is that we will be spending most of our time in one system getting to know one crew. But there will be some familiar faces; Obi-Wan Kenobi shows up in the trailer in the form of a holographic message, and we will be seeing more of him in the series, although the producers wouldn't say how much more. And R2-D2 and C-3PO both show up in the sizzle reel; apparently, we can't have Star Wars on the screen without R2 popping in.